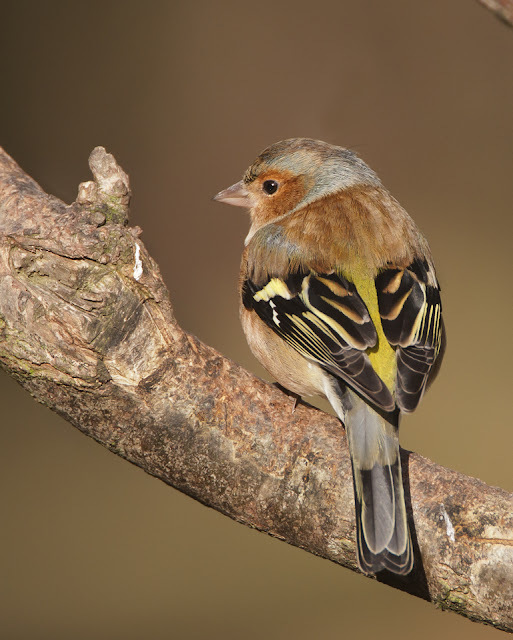 I have looked at many Chaffinches over the years. They are a common bird (according to the BTO there are about 5.6 million territories in the UK) so the chances of running into one or more is quite high if you go out birdwatching. But it seems to me their common-ness has come to count against them. During the winter when I look at a Chaffinch I look to see if it isn't a Chaffinch. It could be a scarcer Brambling. Bramblings, with a fleeting glance, look a little like Chaffinches and only appear on the Patch in winter, never in huge numbers, making them more interesting than their resident cousins. Recently I decided to pay a little more attention to these birds and I discovered that they are well worth extra consideration. When I first looked at the Chaffinch I looked at it head on, right in the face. Yes, it looked exactly like a Chaffinch. Slatey-blue cap, classic seed eaters bill and a pale pinky orange breast. Completely normal. 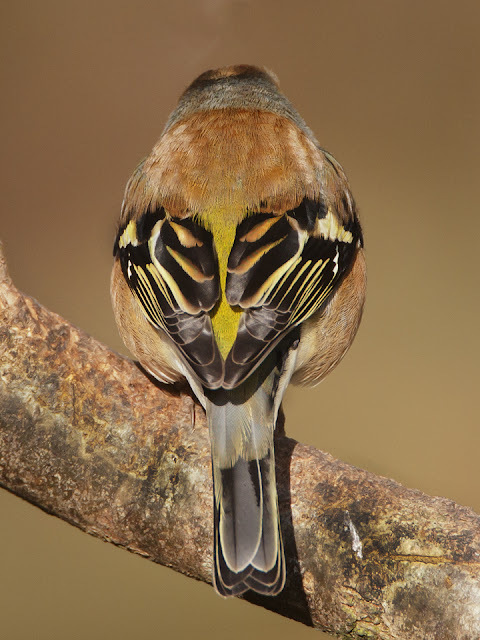 Then I noticed it's back andrealised I never really look at a Chaffinches back and how beautiful it is. The wings fold into tiger striped shields over a patch of sphagnum moss yellow feathers. Tail feathers are grey-black and fringed with white all folded neatly one over the other. Perfect. It's blue cap finishes in a back of cinnamon brown. Off-white stripes line the feathers on the wings. I don't think I could have listed these features a week ago.